Have you noticed all the beautiful statement sweaters in stores these days? There are some really creative looking knits out there, including this one at the Nordstrom’s Fall sale. It’s pretty isn’t it? This romantic ribbed knit sweater is from Joie, a favorite brand of mine. Joie is all about casual, yet luxurious clothing and effortless style. I find their clothes very feminine and modern. Sleeves had been a major focal point in fashion over the last couple of seasons. We’ve seen a lot of wide sleeves, long bell sleeves, and slit sleeves. Now balloon and puffy sleeves seem to the new thing. The gorgeous Juliet sleeves on this sweater (tight at the wrist and puffy at the top) make it a “wow” top. When I first saw this sweater I wasn’t quite sure about the sleeves. The seemed Renaissance and princess-like. It was the vibrant desert rose color that really made me want to try it on. But when I paired the sweater with these cute plaid cropped pants, I loved the look. Do you see the beautiful detail on this cotton-cashmere sweater? The eyelet holes and the way they are arranged to create curves is so feminine and figure-flattering. So what’s the key to wearing a very soft, romantic top like this without looking like a Disney princess? You pair it with something slim fitting, crisp and modern. These pants with their clean lines and menswear-inspired checks balance out the ultra-feminine look and feel of this sweater. And, the cropped pant length gives the outfit a very modern vibe. 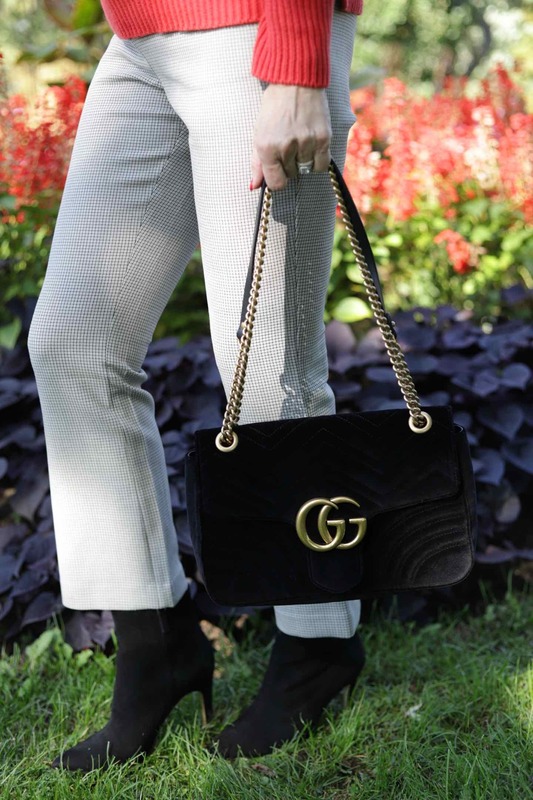 I added fine black suede booties and my Gucci Velvet bag for an extra touch of sophistication. Black accessories always make an outfit look chic. These are suede booties, but you could also wear leather ( also on sale). And there’s the look! The blousy Juliet sleeves give me broad shoulders which shrinks my waist. If you have a pear-shaped figure, this sweater is great to even out your figure, creating width up top to match your wider bottom. If you like the look of my Juliet sleeve sweater and check pants, you can shop the total look here at the Nordstrom Fall sale. Here are a few other great puffy sleeve sweaters on sale now. If you like this sweater, but not so puffy, there is a similar one here. 2 comments on "How to Look Pretty in a Puff Sleeve Sweater (without looking too Princessy) and"
The sweater looks really cool! $2G for a purse. Wowsa.